The Phase 88 is the successor to Terratec's popular eight-in/eight-out EWS 88MT PCI soundcard with breakout box. Way back in SOS October 1999 I reviewed Terratec's EWS 88MT interface (read the review on-line at www.soundonsound.com/sos/oct99/ articles/terratec.htm), and was very favourably impressed with its combination of eight 24-bit/96kHz-capable analogue ins and outs, S/PDIF digital I/O, and MIDI In and Out, all for the bargain price of £399. It's stayed very popular with musicians ever since, particularly since Terratec have kept it well supported with new drivers as new versions of Windows have been launched. Under their Terratec Producer brand, they have now released its successor, the Phase 88, with an identical configuration, but at an even more competitive price of £299. 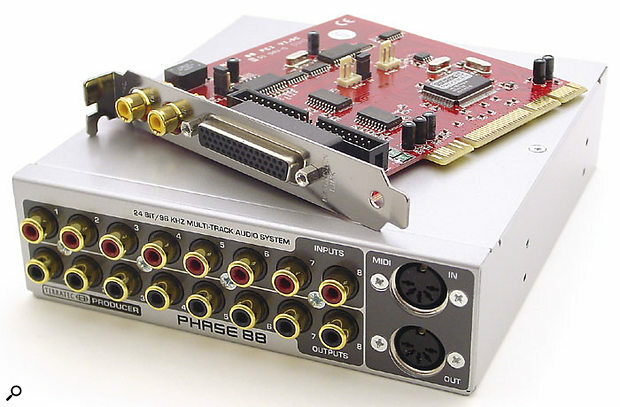 The Phase 88 PCI card thankfully dispenses with the 16-bit and lo-fi AC97 codec circuitry of the EWS 88MT, along with its associated monitor output and CD in and out sockets, but other than this it's remarkably similar, with the same backplate arrangement of D-type connector and twin phono sockets for S/PDIF in and out. It offers the same versatile choice of either mounting the breakout box externally, using the aforementioned D-type connector and supplied four-metre umbilical cable, or internally in a spare 5.25-inch drive bay, via a different internal connector on the PCI card, the supplied D-type adaptor, and a ribbon cable. The breakout box is essentially identical to that of the EWS 88MT, with the same circuit board layout, and identical AKM AK4524 converters, but now has a silver livery and the Terratec Producer logo rather than the previous grey flock finish. Analogue inputs: eight, switched +4dBu/-10dBV sensitivity, with additional 18dB gain available in 0.5dB steps. Analogue outputs: eight, switched +4dBu/-10dBV sensitivity. Supported bit depths: 8, 16 and 24. Internal sample clock: 8, 9.6, 11.025, 12, 16, 22.05, 24, 32, 44.1, 48, 88.2 and 96 kHz. Digital: up to 24-bit 96kHz operation supported in S/PDIF, AC3 or DTS formats. The PC drivers run under Windows 98SE, Me, 2000 and XP, providing ASIO 2.0 and GSIF multi-client support as well as WDM kernel streaming for Sonar users, plus MME and Direct Sound, while the forthcoming Mac OS X drivers will support Core Audio and Core MIDI. The PC drivers and associated Control Panel software also support up to four cascaded cards chosen from Terratec's Phase 88, EWS 88MT/D and Mic 2/8 models, which can be synced together via proprietary internal cables and Sync In/Sync Out connectors. This would give you a total of 32 analogue ins and outs plus eight-channel digital I/O. Being so similar to the EWS 88MT, the Phase 88 already has proven and mature drivers, and for once the bundled driver CD-ROM contained the same up-to-date version 5.40 Windows drivers as the Terratec web site. Exactly the same driver files are installed as for the EWS 88MT/D, EWX 24/96, Mic and Mic 8, and their DMX 6Fire, although each incorporates individual support for the special hardware features of each model. The Phase 88 Control Panel software also sports the new Terratec Producer logo, but is almost identical to that of the EWS 88MT. Spread across four 'pages', it covers Analog Inputs, Digital Mixer and Settings, plus an About page containing details of driver and other software versions. Common features to all four pages include a Scene function that lets you Save, Load and Delete all the current card settings, and selection of multiple cards should you have them fitted, although the manual states that these two features are for Windows only. 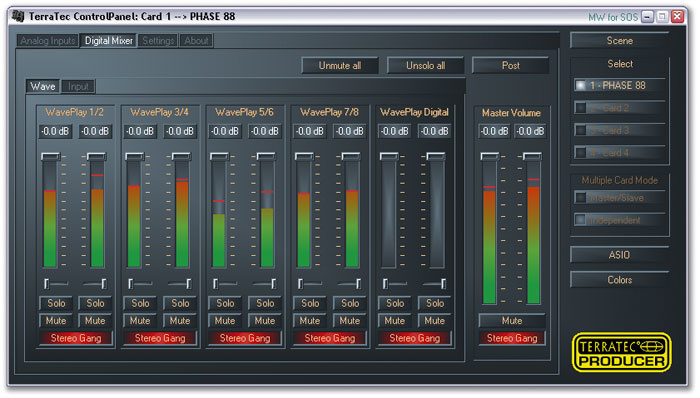 The Analog Inputs page provides input gain faders for each of the eight channels over an 18dB range in 0.5dB steps over and above the nominal -10dBV/+4dBu settings, as well as providing various Auto gain options to set these fader positions automatically according to input signal strength. There are also peak-reading meters displaying incoming signals levels, along with separate Clip indicators. The Digital Mixer page lets you create a monitor mix using the combined signals from all 10 inputs (eight analogue and two digital), along with the same 10 channels of WavePlay playback signals. Each of these 20 signals has its own fader, pan control, meter, Mute and Solo buttons, plus stereo gang buttons for each pair, and there's a Master Volume section with a similar complement of controls bar the Solo buttons. There's also a useful Post button to switch the input level meters between pre- and post-fader operation. 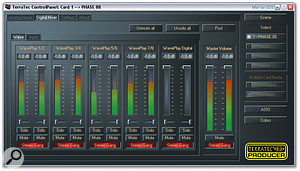 Terratec's familiar control panel software lets you set up complex monitor mixes, and can control up to four cards when using the PC Windows drivers.The Settings page explains the function of the Digital Mixer, since it contains a routing section where you can assign various signals to the five stereo pairs of hardware outputs. By default, WavePlay 1/2 is routed to PCI Out 1/2, and so on, but you can instead listen to any of the input signals or, on the first pair of analogue outputs or the digital outs only, the combined output from the Digital Mixer — an ideal way to listen to a monitor mix for instance. There's also an additional 'In Mixer' input available inside audio applications should you wish to record this stereo signal. Also on this page are the Internal/External clock and sample rate settings, plus various options for such things as the +4/-10 analogue output level, S/PDIF header settings, DMA Buffer Transfer Latency for Windows MME and WDM applications, and choice of Multi-Track or Multi-Application. The latter is once again Windows-only, and allows you to either run a single MIDI + Audio sequencer application, or several side-by-side with multi-client capability. As expected, the Phase 88 sounded identical to the EWS 88MT, and provided similar audio quality to quite a few other soundcards such as M Audio's Delta 66, Terratec's EWX 24/96 and DMX 6Fire, and Edirol's DA2496, all of which use identical converters. Others including Echo's Mia and M Audio's Audiophile 2496 use the AK4528, which provides them with marginally lower background noise levels, but the differences can be small in practice. Compared with my own Echo Mia I could hear some background digital noise from the Phase 88 when I really whacked up my monitor levels, but this was nearly inaudible at normal monitoring levels. However, this time round I had Rightmark's Audio Analyser software to check more performance aspects. This confirmed dynamic range as 95dBA at 16-bit/44.1kHz, 96dBA at 24-bit/44.1kHz, and a good 99dBA at 24-bit/96kHz. These are roughly what I measured for the EWS 88MT using a different method. Frequency response was half a dB down at a good 9Hz and over 46kHz, and THD was a very low 0.0013 percent. I had no problems running Cubase SX 2.0.1 with the lowest 64-sample ASIO buffer setting, providing a latency of just 1.5ms at 44.1kHz (although as always, CPU overhead had more than doubled at this low setting compared with a more conservative 12ms setting). The multi-client capabilities worked well when running Cubase and Gigastudio alongside each other, and the GSIF drivers also worked flawlessly. You need to tweak the Phase 88's setting for DMA Buffer Transfer Latency to get the best results with Sonar, and after some experimentation I managed to run with the lowest 1ms Control Panel setting for this. You need to re-run Sonar 's Wave Profiler after each change, but I eventually managed an excellent effective latency inside Sonar of just 2ms. It may have a new logo, a new colour scheme, and a new PCI soundcard design, but in the audio department the Phase 88 is still essentially the ever-popular EWS 88MT barring a few small changes for the better. As such, it's just as good as its predecessor, providing a straightforward and reliable collection of eight analogue inputs and outputs, plus co-axial digital and MIDI I/O at an excellent price. Its closest competitor is probably M Audio's 1010LT at the slightly cheaper price of about £249, which does provide two additional mic preamps and word clock I/O, but doesn't have the smart breakout box containing external converters, instead using a clutch of flying cables. However, they both have very similar audio quality. Terratec hadn't released Mac OS X drivers for the Phase 88 as I finished this review, but it looks from the manual as if multi-card support may not be forthcoming for these, while OS 9.x drivers may not appear at all (although I doubt that any Mac user buying a new soundcard will worry unduly about this). However, for PC users the Phase 88 already has mature and reliable drivers with excellent performance. It may not provide 192kHz support, but this is irrelevant to most musicians. What it does provide is good-quality audio at up to 24-bit/96kHz, especially considering its price, and with today's faster computers it can now achieve lower latencies than when I reviewed its predecessor. Sounds good to me! Phase 88 Windows XP driver version 5.40. Intel Pentium 4C 2.8GHz processor with hyperthreading, Asus P4P800 Deluxe motherboard with Intel 865PE chip set running 800MHz front side buss, 1GB DDR400 RAM, and Windows XP with Service Pack 1. Tested with Steinberg Cubase SX 2.0.1 and Wavelab 4.01a, Tascam Gigastudio 160 v2.53, Cakewalk Sonar 3.01, Native Instruments Pro 53. Straightforward design with good-quality audio performance. Reliable low-latency PC drivers supporting up to four cards with hardware sync. Mac drivers not yet available. Multiple cards won't be supported by Mac drivers. Terratec's Phase 88 is essentially an upgraded version of the EWS 88MT with exactly the same audio circuitry, but despite this remains excellent value for money for anyone looking for a budget eight-in/eight-out soundcard with digital I/O.